Are You Experiencing Discolored Water? Are You Experiencing Low Pressure? Are You Experiencing Unusual Taste or Odor? How Do We Contact You in an Emergency? Sometimes we must issue a Boil Water Advisory. This may occur if there is a large water main break in your neighborhood or if we have a mechanical problem such as an extended power outage at one of our facilities. In the event that we need to issue a Boil Water Advisory, or some other advisory, we will contact those customers by phone and/or by a door hanger placed on your door. (See HOW DO WE CONTACT YOU IN AN EMERGENCY to change the contact number we have for you). If we need to contact a large number of customers we may also call you by phone and leave a message explaining the situation and giving you directions for more information. We may also use the media, such as local TV, radio, and newpapers to get information to you. Also, this web site will usually contain up to the minute information in an emergency. To avoid possible illness: Use boiled or purchased bottled water for drinking, making ice, brushing teeth, washing dishes, and food preparation. During an extended drought we may ask for voluntary or mandatory water use restrictions. Although York Water has an excellent water supply, there are times when the Governor orders water reductions so that we can make sure we all have enough water to get us through the dry periods. You can check out this link to learn more about conserving water. Will my neighborhood fire hydrant operate in a snow storm? YES. However, you should make sure your local fire hydrant is clear of snow. This allows the snow plow drivers to see them and saves fire fighters valuable time when they are needed. Please contact us or 911 if you see a damaged fire hydrant. What if I lose power to my house? 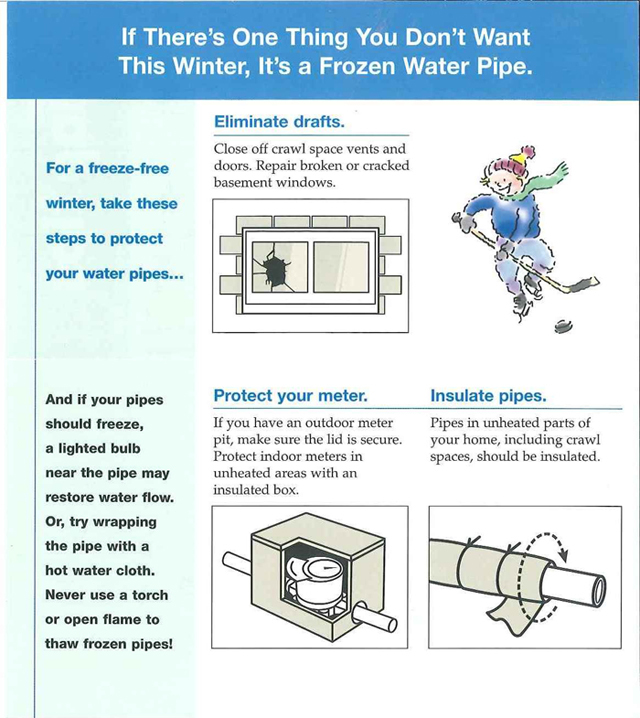 If you do not have heat in your home due to a storm be aware of frozen pipes. Although the pipes in the street and the yard will be OK, if you still don’t have heat, the pipes inside your house may be at risk. You should either let both the hot and cold water run slightly from each faucet, or shut off the plumbing where it enters your house and drain the pipes at the lowest point. If you do drain the lines, you should also wrap blankets or towels around the incoming pipe and water meter to keep them from freezing. Also, don’t forget about water in the drain traps below your sinks.If its an extended outage, these may also freeze and damage your drain lines. Even if you let the spigots run slightly, the water will cost less than a penny per gallon, which is much cheaper than the cost to repair frozen and damaged pipes. A Fire Hydrant can only help protect you if it is accessible. 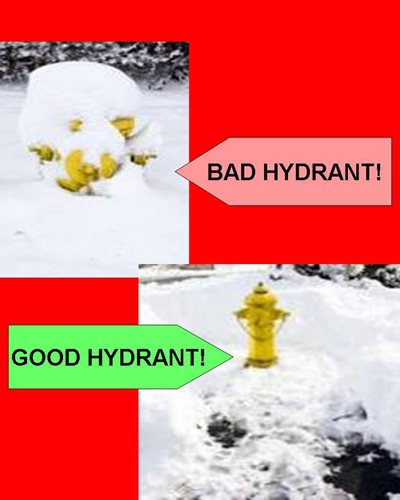 Please do not cover hydrants with snow and please help keep them clear. Thanks! People acting suspiciously around water supply facilities. Large trucks dumping anything into any stream or lake. Unattended packages or suspicious objects near water supply facilities. If in doubt, call us out! We don’t mind responding to a false alarm! A small or short storm event should not have an impact. Even when electricity goes out, your water should still be available and ready to use! Severe floods and falling trees may cause water disruption if the buried water mains or service lines are broken by tree roots pushing against a water line or if flood waters dislodge a water main passing under a nearby creek or river. We have back-up generators at our facilities that automatically operate in an emergency. However, sometimes these can also fail to operate due to the storm event which may lead to reduced water pressure. Homeowners should know the location of all emergency shut off valves, including gas and water. If it appears to be a long term event, such as a large hurricane, you may want to fill a bath tub with water. This can then be scooped up in a pitcher and poured directly into a toilet bowl to flush the contents. If it appers to be a long term event, such as a large hurricane, you may want to fill some water bottles for drinking and cooking. After a storm passes, what should I do? Be safe! Avoid downed power lines and flooded areas. Check a faucet and make sure the water is working. If you notice water in your basement or neighborhood that you’ve never seen before, it is most likely due to flooding and not a water main break. Please do not call us in this case. If it is an obvious water line break (water shooting into the air, exposed water pipe, etc. ), then give us a call. We do not pump out basements. Our crews may be busy repairing main breaks, cutting trees so we can access our facilities, resupplying our generators, etc. We do not have the equipment or resources to pump out your flooded basement. If your tap water is cloudy or doesn’t seem right, let it run a few minutes. If it doesn’t clear up, give us a call at 845-3601. If you are experiencing low or no water pressure, check your service line, and then give us a call at 845-3601. Remember your neighbors on wells! When the power goes out, they will lose their water supply. Be a good neighbor and see if they need some water! When there’s an earthquake, underground pipes in the home may shift and move. The same is true with the plumbing for swimming pools. When pipes move, that’s when there’s a potential danger for water and gas leaks. And if they are left untreated not only are leaks hazardous to your health but hazardous to property. So it’s important for homeowners to check for leaks after earthquakes and aftershocks. Make sure the main house shut off valve is in good working order. A failed shut off valve will not stop the water flow. All shut off valves should be tagged so they are easy to find. As you go over the emergency plan with family members, everyone should know how to turn these valves off. In the event of an earthquake, you should turn off these main valves until it can be determined that there are no leaks in the gas or water lines. The first and easiest way to tell if you have a leak is to listen for water running. Do you hear water running when everything is turned off? Does your water meter continue to spin when everything is turned off? And if your next water bill is higher than normal, there most likely is an undetected leak. An open fire hydrant or large water demand in your area may have stirred up sediment in the pipes. A water main break in your area may have stirred up sediment in the pipes. The water may have air in it. If it has a white, milky appearance, it may just be air. This is sometimes due to temperature changes in the water. If you fill a glass and let it sit for a few seconds and it clears up, this is probably the problem. In all cases, you should let the faucet run for a few minutes and see if it clears up. If it doesn’t clear up, then give us a call and we’ll come check it out! Check other water fixtures in the house and check both hot and cold water. Turn off all of the water fixtures and see if the water meter is spinnning. If it is, then you may have a leak in your house. Perhaps check with a neighbor and see if they have the same problem. If you still have the problem, give us a call and we’ll come check it out! This is pretty rare. However, if the pressure in your house is over 80 pounds per square inch (PSI), you should have a Pressure Reducing Valve (PRV) near the water meter. This PRV is your property. It may need adjustment, or it may need to be repaired or replaced. You should contact a plumber if you need assistance with the PRV. You should also check the water at several faucets and check hot and cold water. Sometimes the source of the problem is your hot water heater. In all cases, you should let the faucet run for a few minutes and see if the problem goes away. If it doesn’t, then give us a call and we’ll come check it out! When you signed up for water service you probably provided us with a telephone number. If we need to contact a large number of customers we may call you by phone and leave a message explaining the situation and giving you directions for more information. We may also use the media, such as local TV, radio, and newpapers to get information to you. If we only need to contact a limited number of customers, we may knock on your door and place a door hanger placed on your door knob explaining the situation. Also, this web site will usually contain up to the minute information in an emergency. If you would like to update or change the phone number or provide us with an e-mail address, click below for an on-line form!